This article is about the original Middle Eastern folk tale. For the Disney franchise, see Aladdin (franchise). For other uses, see Aladdin (disambiguation) and Aladdin (name). "Magic lamp" redirects here. For other uses, see Magic lantern (disambiguation). Aladdin (/əˈlædɪn/; Arabic: علاء الدين‎, ʻAlāʼ ud-Dīn/ ʻAlāʼ ad-Dīn, IPA: [ʕalaːʔ adˈdiːn]) is a folk tale of Middle Eastern origin. It is one of the tales in The Book of One Thousand and One Nights (The Arabian Nights), and one of the best known—despite not being part of the original Arabic text. It was added to the collection in the 18th century by the Frenchman Antoine Galland, who attributed the tale to a Syrian storyteller, Youhenna Diab. The Sorcerer traps Aladdin in the magic cave. Aladdin is an impoverished young ne'er-do-well, dwelling in "one of the cities of China". He is recruited by a sorcerer from the Maghreb, who passes himself off as the brother of Aladdin's late father, Mustapha the tailor, convincing Aladdin and his mother of his good will by pretending to set up the lad as a wealthy merchant. 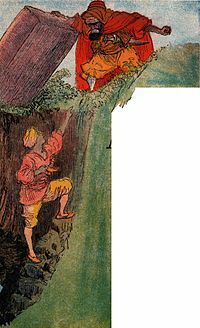 The sorcerer's real motive is to persuade young Aladdin to retrieve a wonderful oil lamp from a booby-trapped magic cave. After the sorcerer attempts to double-cross him, Aladdin finds himself trapped in the cave. Aladdin is still wearing a magic ring the sorcerer has lent him. When he rubs his hands in despair, he inadvertently rubs the ring and a jinnī (or "genie") appears who releases him from the cave, allowing him to return to his mother while in possession of the lamp. When his mother tries to clean the lamp, so they can sell it to buy food for their supper, a second far more powerful genie appears who is bound to do the bidding of the person holding the lamp. 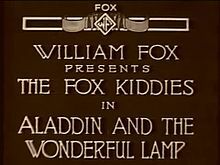 With the aid of the genie of the lamp, Aladdin becomes rich and powerful and marries Princess Badroulbadour, the sultan's daughter (after magically foiling her marriage to the vizier's son). The genie builds Aladdin and his bride a wonderful palace, far more magnificent than the sultan's. John Payne quotes passages from Galland's unpublished diary: recording Galland's encounter with a Maronite Syrian storyteller from Aleppo, Youhenna Diab. According to Galland's diary for March 25, 1709, he met the man he called "Hanna", who had travelled from Aleppo to Paris with Paul Lucas, a celebrated French traveller. Galland's diary reports that his translation of the Arabic version of "Aladdin" into French, was first made in the winter of 1709–10. It was included in his volumes ix and x of the Nights, published in 1710. Payne also records the discovery in the Bibliothèque Nationale in Paris of two Arabic manuscripts containing Aladdin (with two more of the "interpolated" tales). One was written by a Syrian Christian priest living in Paris, named Dionysios Shawish, alias Dom Denis Chavis. The other is supposed to be a copy Mikhail Sabbagh made of a manuscript written in Baghdad in 1703. It was purchased by the Bibliothèque Nationale at the end of the nineteenth century. The opening sentences of the story, in both the Galland and the Burton versions, set it in "one of the cities of China" and imply, at least, that Aladdin is Chinese. On the other hand, there is practically nothing in the rest of the story that is inconsistent with a Middle Eastern setting. For instance, the Sultan is referred to as such rather than being called the "Emperor", as in some re-tellings, and the people in the story are Muslims: their conversation is larded with devout Muslim platitudes. A Jewish merchant buys Aladdin's wares (and incidentally cheats him), but there is no mention of Buddhists or Confucians (or other distinctively Han Chinese people). An 1886 theatre poster advertising a production of the pantomime Aladdin. Aladdin, an upcoming Disney live-action remake of the 1992 animated film, planned for release in 2019. It will star Mena Massoud as the title character, Naomi Scott as Jasmine, Marwan Kenzari as Jafar, and Will Smith as the Genie. Aladdin and the Magic Lamp, an episode of Rabbit Ears Productions' We All Have Tales series, televised on PBS in 1991, featuring John Hurt as narrator, with illustrations by Greg Couch and music by Mickey Hart. This version is set in Isfahan, Persia, and closely follows the original plot, including the origin of the sorcerer. The audiobook version was nominated for a Grammy Award for Best Spoken Word Album for Children in 1994. The title character was featured along with the world of Agrabah in the sixth season of ABC's hit TV show Once Upon a Time, played by Deniz Akdeniz, with Jasmine played by Karen David and Jafar played by Oded Fehr. Jafar was played by Naveen Andrews in the spin-off, Once Upon a Time in Wonderland. The story of Aladdin was featured in Alif Laila, a TV series directed by Ramanand Sagar in 1994 and was telecasted on DD National. ^ "Aladdin". Archived from the original on 5 February 2008. Retrieved 2008-01-22. ^ "Aladdin and the Magic Lamp - Rabbit Ears". www.rabbitears.com. Retrieved 2019-04-10. Razzaque, Arafat A. (10 August 2017). "Who wrote Aladdin?". Ajam Media Collective. Retrieved 25 February 2019. Wikimedia Commons has media related to Aladdin. The Thousand Nights and a Night in several classic translations, with additional material, including Payne's introduction  and quotes from Galland's diary.